Weinberg freshmen Cinthya Rodriguez, Samantha Bahena and Genesis Villalobos write letters at a campaign sponsored by For Members Only and Alianza that aimed to allow students to share their experiences and also raise awareness about the story of Northwestern maintenance worker Michael Collins. Collins encountered in December his stuffed bear hung next to his desk in a manner akin to a lynching. After a number of racially motivated incidents on campus and in Evanston in the past year, student groups began organizing dialogues to combat racism and relay their concerns to University administrators. 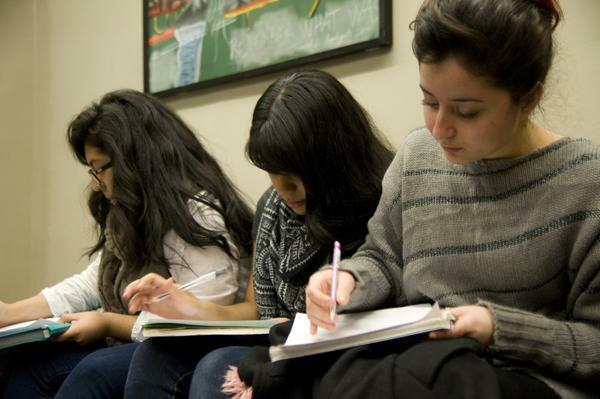 Following a combined For Members Only and Alianza general meeting on Sunday, the groups hosted a letter-writing campaign for students to write about experiences of racism and prejudice at Northwestern. The Thursday event took place from 4 to 7 p.m. at The Black House and drew about 50 students, Alianza co-president Lucia Leon said. Students hand-wrote letters that the groups will upload to NU Collective Stories, an online blog about inclusion and diversity on campus. “These are going to be used as tools to raise awareness to the greater community at NU about the feelings that people have as people of color,” said Leon, a Communication junior. FMO and Alianza organized this event as one response to instances of racism on campus in the last academic year. In the latest incident, maintenance worker Michael Collins said he found a black teddy bear hanging from a rope as if it was lynched at his Technological Institute office the morning of Dec. 3. “Collins spoke out about his story and we as students decided we needed to speak out about our stories as people of color,” Leon said. She said the organizations will deliver the letters directly to an administrator, though they have not yet determined to whom the letters will go. Alianza member Sandra Garnica said she hoped the event helped students understand they are not alone in their frequent experiences of racism and prejudice. “It’s one thing to know your story, but it’s another to write it out and see it in your hands,” the Weinberg senior said. Like Garnica, SESP junior Jasmine Wiggins said she attended the letter-writing session to convey her displeasure with how the administration has historically and recently responded to racist incidents and failed to change campus culture. In her letter, she said she wrote about the need for a more diverse curriculum, including required ethnic courses. Jay Jordan, FMO’s vice coordinator of programming, announced the group’s intentions to host a variety of programming in upcoming weeks at an FMO and Alianza meeting Sunday. In addition to the letter-writing campaign, the groups are organizing a walk of solidarity for Collins on Feb. 28, a video documenting recent racial controversies at NU and a series of small-group discussions. “We really need to communicate the fact that we’re all unpleased with the way this campus is,” the McCormick junior said at the meeting.